"If there is one thing the island knows--it's carnage and war." Fighting and war are seemingly eternal stressors applied to the world. No matter how many peaces are brokered, more conflicts will arise. At some point though, the world on which those battles are waged will wage one of its own to stop the fighting forever. That's the stakes in The Jungle Book: Fall of the Wild #1 from Zenescope Entertainment. The issue is written by Mark L. Miller, illustrated by Michele Bandini, colored by Grostieta and lettered by Matthew Krotzer. The war between the species is raging and each tribe makes a power play to become the strongest. Mowglii remains the one person who sees a greater threat on the horizon and must do all she can to unite them all. She's the one person who can bring the island together against and even larger threat--the island of Kipling itself. 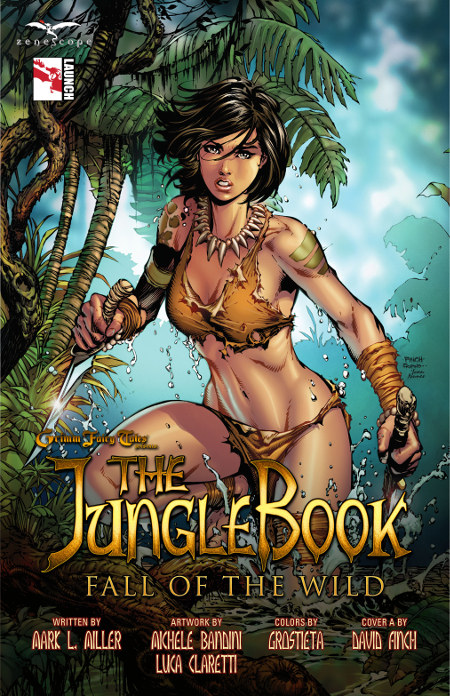 The Jungle Book: Fall of the Wild #1 is another entry in Zenescope's portrayal of The Jungle Book and it does a good job of getting the reader up to speed if they missed out on the first miniseries. Miller pitches Mowglii as somewhat complacent about the fact that Kipling is tearing itself apart and Baloo is content to contribute to that violence in order to protect the island. The warring tribes all boast a human counterpart who has embraced the qualities of that tribe, so it's expected that Mowglii will work with them to fight the island. Miller offers a story that quickly reveals the plot, but also introduces characters to the reader who may not be familiar with them in a way that doesn't feel forced. Kipling has a very natural ebb and flow to it based on the interactions between the tribes and Miller captures that effectively. There's no easy way to illustrate war, but Bandini manages to do so by mixing together combat scenes with shades of gore when appropriate. Considering the inhabitants of Kipling are largely bestial, it's only fitting that there are some scenes featuring a bear ripping another bear to shreds for instance. Beyond the violence, the artwork looks almost like a cartoon, with Bandini emphasizing characters with looks that are clearly not meant to be perceived as realistic. She manages to tamp down the Zenescope sexiness for the most part, save for Mowglii's choice of jungle attire. Grostieta's colors are very vibrant and accentuate the jungle setting well. The Jungle Book: Fall of the Wild #1 presents a setting rife with chaos and warfare; one that--if left unchecked--is poised to rip it apart. The ending of the issue poises the characters to face a foe that's unfamiliar to all involved and will require uneasy alliances to be forged. Miller's story effectively taps into that burgeoning dynamic, presenting a tale that's easily accessible to new readers and offers a nod to those who've read Zenescope's earlier The Jungle Book series. Bandini's illustrations are vibrant and make the jungle as much a character as its inhabitants. The Jungle Book: Fall of the Wild #1 boasts a story that's a little light on the drama and unknowns, but does seem to be fairly ambitious. The Jungle Book: Fall of the Wild is in stores December 24.